Former Pennsylvania stand-out Evan Henderson (Armagh, PA) competed for the first time under the Badger Regional Training Center – winning the Bill Farrell International Open at 65 kilograms. 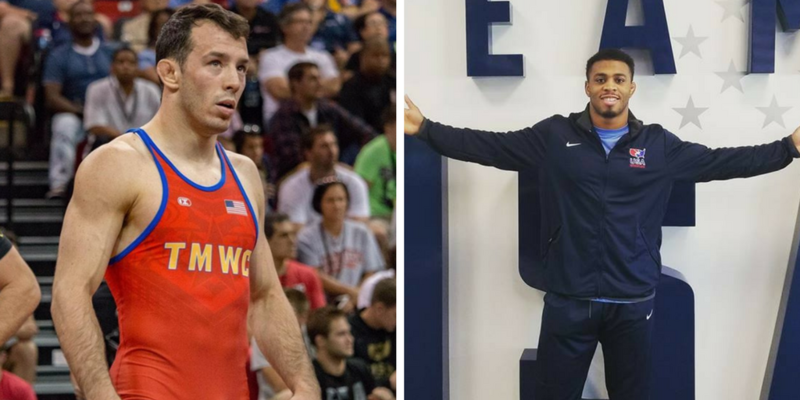 The title automatically qualifies Henderson, a former Kiski Prep and North Carolina wrestler, for the 2018 World Team Trials. He will compete in the inaugural Final X Series on June 16th in State College. Two years ago Evan went (3-2) at the Bill Farrell Open and last year was fifth at the World Team Trials. Henderson, a 2-time All-American for the Tar Heels, had his toughest match in the quarterfinals against former Minnesota Gopher Nick Dardanes. Down (4-2) in the second period, Henderson stormed back hitting a head-inside single leg to go up (6-4) where the match would end. Henderson won (20-10) in the semifinals and hit a nasty headlock in the finals grabbing the fall in just (0:26). The other Pennsylvania finalist inside the New York Athletic Club was, to say the least, surprising. It was the first time the former Ohio State All-American Kenny Courts (Harrisburg, PA) and 2-time PIAA State Champion officially competed in two years. Quite the comeback party for Courts who moved up to 92 kilograms (202 pounds), for the Bill Farrell Open. Competing for Titan Mercury, Courts opened with a (17-6) win over second seed Nikko Reyes, going off for fourteen straight points after trailing (6-3) to end the first. He rolled to a (10-0) win in the quarterfinals before meeting Russia’s Arsen-Ali Musalaliev in the semifinals. His return looked to be cut short when Musalaliev, a 2016 UWW Junior World Champion, raced out to a (9-0) advantage on Courts as time was running short in the match. That is when Kenny snapped Musalaliev down hard near the edge and hit a cement mixer, rolling through, and planting him on his back for the fall. It was too much to claim it all as Kenny fell in the finals to Kazakhstan’s Chilayev Iliskhan, who scored ten points in the final period to win it (16-6). Other medalists from Pennsylvania included Austin Miller (Hempfield/Bucknell) who took fourth at 57 kilograms and Michael Evans (Enola, PA/Iowa) who took fourth at 79 kilograms.